I just returned from Cyprus, and one of the saints who figures largely in the church dedications of the island is St. Spyridon, one of the Fathers who made the journey to Nicaea in 325. 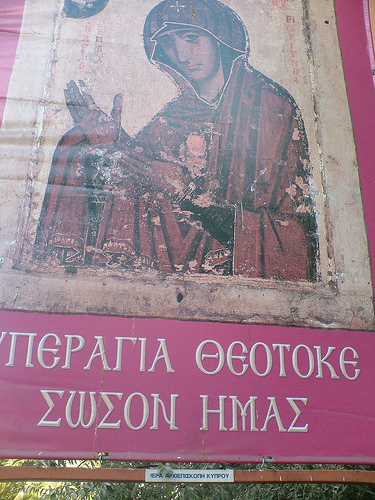 You can always tell St. Spyridon when you see him on a church wall (as on the exterior of St. Sozomen’s Church in Galata, Cyprus [my photo to the left]) because of his beehive hat. Spyridon was a literal shepherd before he became a spiritual shepherd (in Latin, that would be pastor). As a sign of his humble origins, he is always shown wearing this traditional Cypriot headgear. 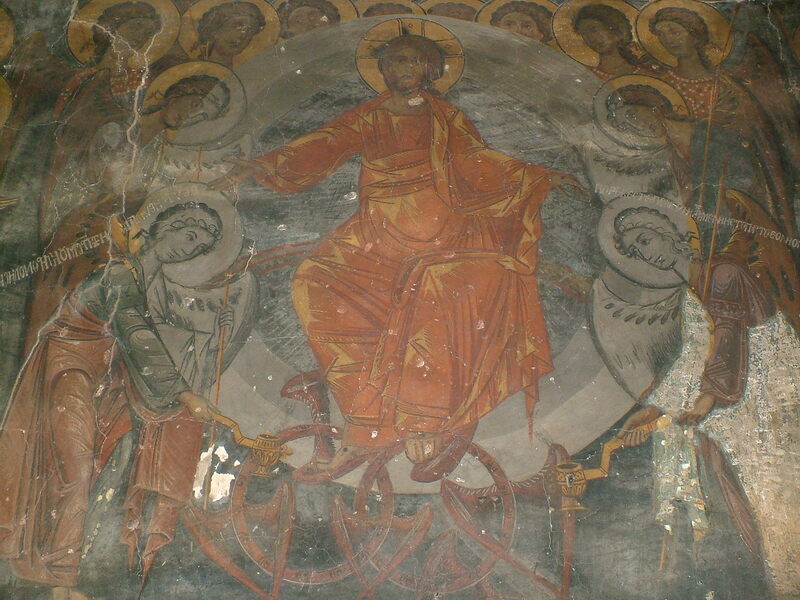 The image to the left is from a large fresco of the Council of Nicaea (the whole thing is viewable here). It’s hard to tell because I didn’t have a good angle to take the photo (I took it from a good distance below the image), but Spyridon is pictured performing a miracle that tradition relates concerning his actions at Nicaea. He is clutching in his fist a tile. Out of the top of the tile comes a flame, from the bottom drips water, and soil remains in his hand. This threefold nature of the tile was a refutation of Arius, showing how three things could share a single essence, an object lesson in the Holy Trinity. 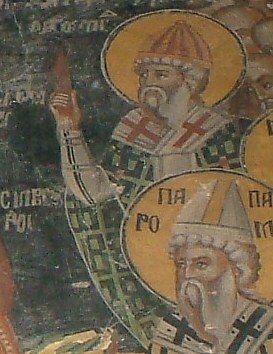 With respect to Spyridon, so great was his sanctity while a shepherd, that he was thought worthy of being made a Pastor of men: and having been assigned the bishopric of one of the cities in Cyprus named Trimithus, on account of his extreme humility he continued to feed his sheep during his incumbency of the bishopric. Many extraordinary things are related of him: I shall however record but one or two, lest I should seem to wander from my subject. Once about midnight, thieves having clandestinely entered his sheepfold attempted to carry off some of the sheep. But God who protected the shepherd preserved his sheep also; for the thieves were by an invisible power bound to the folds. At daybreak, when he came to the sheep and found the men with their hands tied behind them, he understood what was done: and after having prayed he liberated the thieves, earnestly admonishing and exhorting them to support themselves by honest labor, and not to take anything unjustly. He then gave them a ram, and sent them away, humorously adding, ‘that ye may not appear to have watched all night in vain.’ This is one of the miracles in connection with Spyridon. Another was of this kind. He had a virgin daughter named Irene, who was a partaker of her father’s piety. An acquaintance entrusted to her keeping an ornament of considerable value: she, to guard it more securely, hid what had been deposited with her in the ground, and not long afterwards died. Subsequently the owner of the property came to claim it; and not finding the virgin, he began an excited conversation with the father, at times accusing him of an attempt to defraud him, and then again beseeching him to restore the deposit. The old man, regarding this person’s loss as his own misfortune, went to the tomb of his daughter, and called upon God to show him before its proper season the promised resurrection. Nor was he disappointed in his hope: for the virgin again reviving appeared to her father, and having pointed out to him the spot where she had hidden the ornament, she once more departed. Such characters as these adorned the churches in the time of the emperor Constantine. These details I obtained from many inhabitants of Cyprus. I have also found a treatise composed in Latin by the presbyter Rufinus, from which I have collected these and some other things which will be hereafter adduced. What I like about the story of St. Spyridon is the fact that he was made a presbyter for all the right reasons — it wasn’t because he had a clear singing voice for the liturgy, or because he was the only literate man in the village, or because he had the right educational credentials but because of holiness of life. He was so holy and had such spiritual authority that, although a simple shepherd, the people knew that he was the right man for the job. This is a stark contrast with the lawyers and aristocrats who fill the clergy elsewhere in fourth century! It is a stark contrast to today where we are more concerned with one having the right training than we are with whether one is actually a spiritual leader. Perhaps seminaries and bishops should take the life of St. Spyridon to heart when they are seeking out and evaluating postulants for ordination. Imagine if we had a whole generation of clergy chosen for the holiness of their lives! We might even see spiritual fruit as a result! Remember as well: God chooses the simple. Few of us are Origens — and he was branded a heretic post-mortem — but by the grace of Christ, many can be Spyridons. Here are some highlights from St. John of Damascus’ On the Orthodox Faith, 1.8 (read it here for yourself!). Each paragraph is a separate quotation. In treating, then, of the generation of the Son, it is an act of impiety to say that time comes into play and that the existence of the Son is of later origin than the Father. For we hold that it is from Him, that is, from the Father’s nature, that the Son is generated. And unless we grant that the Son co-existed from the beginning with the Father, by Whom He was begotten, we introduce change into the Father’s subsistence, because, not being the Father, He subsequently became the Father. For the creation, even though it originated later, is nevertheless not derived from the essence of God, but is brought into existence out of nothing by His will and power, and change does not touch God’s nature. For generation means that the begetter produces out of his essence offspring similar in essence. But creation and making mean that the creator and maker produces from that which is external, and not out of his own essence, a creation of an absolutely dissimilar nature. But if we say that the Father is the origin of the Son and greater than the Son, we do not suggest any precedence in time or superiority in nature of the Father over the Son (for through His agency He made the ages), or superiority in any other respect save causation. And we mean by this, that the Son is begotten of the Father and not the Father of the Son, and that the Father naturally is the cause of the Son: just as we say in the same way not that fire proceedeth from light, but rather light from fire. 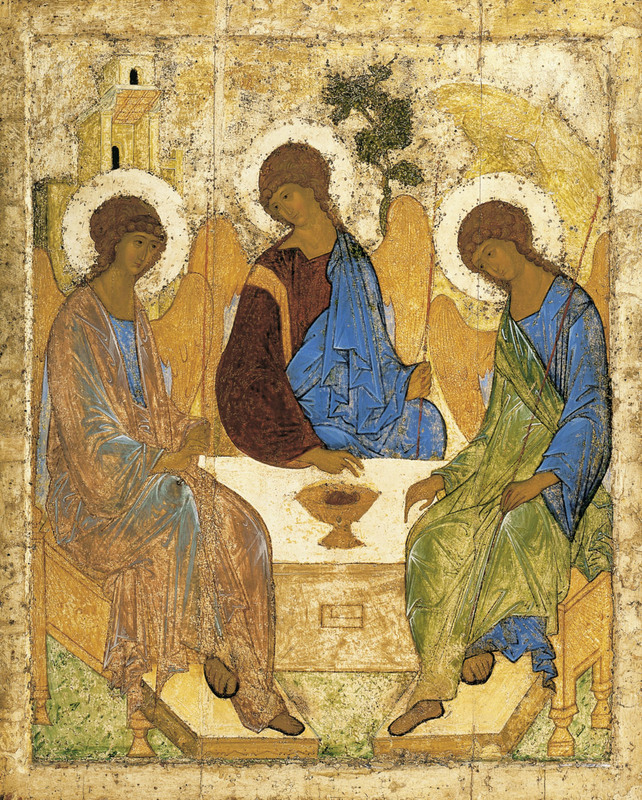 it is quite impossible to find in creation an image that will illustrate in itself exactly in all details the nature of the Holy Trinity. For how could that which is create and compound, subject to flux and change, circumscribed, formed and corruptible, clearly shew forth the super-essential divine essence, unaffected as it is in any of these ways? Now it is evident that all creation is liable to most of these affections, and all from its very nature is subject to corruption. But the Son is derived from the Father after the manner of generation, and the Holy Spirit likewise is derived from the Father, yet not after the manner of generation, but after that of procession. And we have learned that there is a difference between generation and procession, but the nature of that difference we in no wise understand. Further, the generation of the Son from the Father and the procession of the Holy Spirit are simultaneous. The subsistences then we say are perfect, that we may not conceive of the divine nature as compound. For compoundness is the beginning of separation. And again we speak of the three subsistences as being in each other, that we may not introduce a crowd and multitude of Gods. Owing to the three subsistences, there is no compoundness or confusion: while, owing to their having the same essence and dwelling in one another, and being the same in will, and energy, and power, and authority, and movement, so to speak, we recognise the indivisibility and the unity of God. For verily there is one God, and His word and Spirit. For there is one essence, one goodness, one power, one will, one energy, one authority, one and the same, I repeat, not three resembling each other. But the three subsistences have one and the same movement. the subsistences dwell in one another, in no wise confused but cleaving together, according to the word of the Lord, I am in the father, and the father in Me: nor can one admit difference in will or judgment or energy or power or anything else whatsoever which may produce actual and absolute separation in our case. Wherefore we do not speak of three Gods, the Father, the Son, and the Holy Spirit, but rather of one God, the holy Trinity, the Son and Spirit being referred to one cause, and not compounded or coalesced according to the synæresis of Sabellius.